Not so long ago we had an adorable House Martin family nesting outside the window. It was super cute, but what wasn’t not so great is the build-up of droppings on the window sill. Bird droppings and the faeces of other animals are highly toxic. It’s bad enough outside a domestic property but you can imagine the damage that this type of mess can make in a food processing, preparation or packing environment. That’s why food manufacturers and caterers need to take steps to keep food pests away from their premises. The trouble is that pests are resilient and persistent critters, they travel easily and they breed like crazy. Allow pests into your premises and they have the potential to spread such pathogens as listeria, Salmonella, E.Coli, toxoplasmosis, tuberculosis and gastroenteritis. The main pests are rats, mice, birds and insects. They spread disease by defecating and urinating, regurgitating food, and by shedding casings and dying. The discovery of rat droppings, roosting birds or an infestation of flies can spell disaster for a company if they are discovered during a third-party audit. The risk to food safety is extremely serious too. Were you aware, for example, that filth flies can carry over 100 pathogens that can cause disease in humans. Filth flies include drain flies, flesh flies and house flies. As their name suggests they move from filth to food indiscriminately. They feed on decaying and rotten food, carcases of animals and faecal matter as well as on fresh and stored food and ingredients. Mice can squeeze through holes the size of a pencil and under the smallest gaps in doorways or skirting. Rats can gnaw through hardwood wires and cabling (as well as cardboard boxes and other packaging). Pigeons can get into premises and build roosts. Insects can fly into premises through minute spaces and make themselves at home in nooks and crannies behind and under equipment or in drains. Rat and mouse droppings are small, dry and look like brown grains of rice. Vermin such as these urinate frequently when eating, so the chances are you’ll smell that they’re about too. Greasy smears and paw prints are another sign of rodent infestation. Pests build their nests from whatever is to hand e.g packaging. So look for signs of this. As I mentioned before, they can gnaw through wood and plaster, so look for gnaw and scratch marks. Look for signs of nibbled packaging on raw ingredients and spillages. Certain pests, such as weevils, can live within dry ingredients, so always give a good visual inspection before adding to product mixtures. 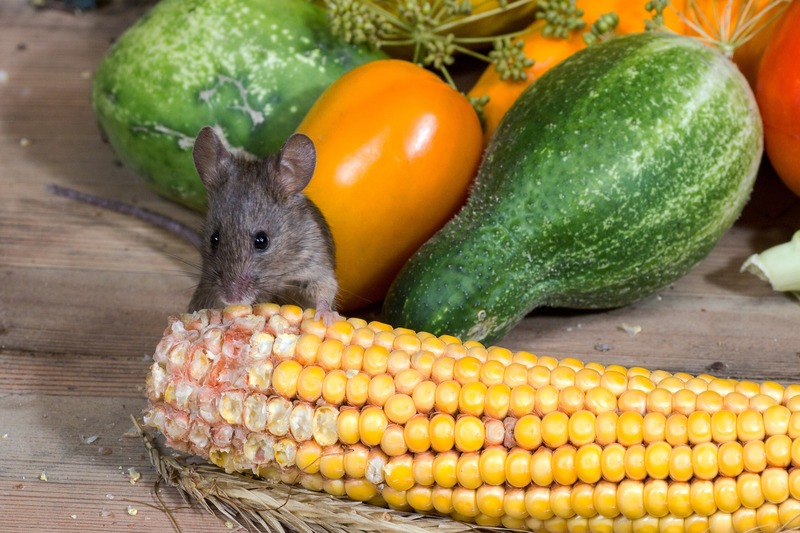 You know some of the signs, but how do you keep food pests out? Make sure all doors to production areas are secured. This means at all times. If you need to go out, close the door behind you. In addition, you should ensure that any doors leading to outside remain closed. Keep insects out by installing window screens. If the window is open to let air in, that’s the only thing it should be letting in. Cover all bins, especially any containing food waste. Empty bins regularly and tie bin bags securely before taking them out to external bins – which should have closed lids. Check the building regularly for any holes and plug them up to stop rodents having access. Don’t allow birds to nest under the roof or eaves of the building. Don’t put fly units over food surfaces. If they are too shallow the insects will drop out of the tray. Ensure that you clean down equipment properly. Remember insects thrive in damp environments and will breed in the smallest of spaces. You can find out more about pests and pest control on our Level 3 Food Safety and Hygiene or Level 4 Food Safety and Hygiene courses. If you think you have a pest problem, it’s often best to call in a professional pest control company. The majority are aware what BRC auditors and Environmental Health Officers are looking for. Following an initial visit, the contractor will produce a report of their findings. This will detail current and potential sites of breaches or infestations and their recommendations. Many also offer comprehensive silo cleaning and deep cleaning of food equipment and production spaces as well as the supply and fitting of insect screens, PVC curtains and doors, brush strips and other proofing solutions such as electronic rodent capture and electronic fly killers. Given that they will be operating in a food production environment, many also offer pesticide-free solutions to pest control and chemical-free fumigation services. Previous post: Norovirus and Shigellosis – what causes these illnesses?